Over in the official Konflikt ’47 Facebook Group, the guys from Clockwork Goblin (the guys behind the design of the game and the models) have been getting a little over-excited at the prospect of what’s to come… the scope of possibilities and potential for the game…. …some of their excitement has spilled-out into the wider world in the form of some sneaky previews which have emerged… we’ve pinched some of the images, and key parts of the accompanying text for your delectation! 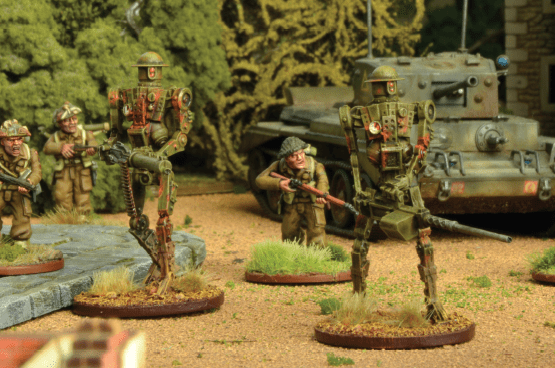 Note that these are early concept renders and test prints – all aspects of the design are liable to change before the finalised models head to production this information is direct from Warlord Games. Of course, all you German commanders are going to need a little extra firepower if you’re to tackle the great Soviet beasts shown above… and boy-oh-boy is it coming! As if all of that weren’t enough… Russ also hinted at what he’s been working on more recently to expand the range… including ‘Book 2’ for late next year (seriously another one I hope its only an expansion and not a do over)! …and in the coming few months, the mayhem is sure to escalate as the Soviets and British join the frey in force! GET YOUR KONFLIKT HAPPENING TODAY TROOPER!